“Thinking out of the Box” is a powerful metaphor, one that challenges us to consider possibilities previously not even imagined, and to extend our vision – of the world and ourselves – to include alternative, complementary, or even contrasting perspectives. It means engaging in self-reflective, creative and/or lateral thinking, beyond what is obvious or commonplace, or even implicit in what we say and do. Most of all, it means becoming aware of the existence of “the box” (i.e. what we take for granted and how this conditions our conduct) and also being willing to question the validity of our convictions so as to expand our knowledge. It does not mean being innovative at all costs or for its own sake – in fact, it may mean going back to old practices. Rather, it requires the humility to pose “simple” questions meant to ascertain the accuracy of commonly held beliefs and taking stock of the findings. Thinking out of the box is an act of the imagination that brings new insights into our values and cultural assumptions, and an act of courage pushing us away from our comfort zone. At this AIA conference we ask colleagues to be bold and curious enough to open the door of their scholarly “box” and to explore the research space around it on a quest for evidence of what we assume or claim we already know. We ask them to be non-conformist, generating ideas that may challenge prevailing practices and beliefs; to dare to cross the boundaries of their sub-disciplines, interacting with scholars from neighbouring fields; and to try out something “unfashionable” that is not guaranteed to succeed, be understood or be well-received in order to pursue knowledge. Thinking out of the Box in Language Studies – in linguistic, language teaching and translation studies – may involve relabelling phenomena and concepts; investigating familiar communicative practices through novel methods; checking whether the concepts we use are suitable for describing the phenomena we study; determining to what extent our claims and assumptions are supported by the evidence available; and exploring approaches that are sometimes claimed to have reached the limits of their potential. Thinking out of the box may also be considered in terms of innovation, creativity, a rethinking of attitudes and approaches, and even a ‘daring’ return to theories and practices that may have been swept aside in the drive to move ever forward. For this reason, analyses are also welcome to take a historical /diachronic approach to different genres. Comparing and contrasting (the accuracy of) definitions of key concepts. Challenging old and new trends in English language and translation teaching (e.g. cooperative learning, competitive learning, rote-learning, drills, creativity, project-based learning, curriculum-centred learning). Cutting edge cognitive approaches to phonology, morphology, semantics, syntax, pragmatics/discourse and interpreting/translation. Standard and non-standard approaches to English language and translation testing. Language/translation learning and soft skills development. Gender in linguistics, language teaching and translation. Student perceptions of language learning and teaching practices. Emerging real-world settings, goals and materials. Proficiency, translanguaging and engagement in English-medium instruction. Corpora in linguistics, language teaching and translation. World Englishes, ELF and ‘standards’ of English. Convergence-divergence of theories, practices and findings in linguistics, language teaching and translation. Literature and linguistic description, language learning and translation practices. Exploring aspects of register and genre in linguistics, language teaching and translation. Challenging established research methods and developing innovative research practice. Describing, teaching and translating cross-linguistic verbal and non-verbal behaviour. Alternative approaches to media in linguistics, language teaching and translation. We will take into consideration both proposals for individual papers and for panels (3-4 participants). Proposals for each individual paper should be approx. 400 words long. Please send also a 200-word bio for each participant. Thinking out of the Box in Literary Studies means rethinking, finding new approaches, challenging not only assessments on individual authors or works, but sometimes the very structure of our approach to literature. This perspective prompts a number of large-scale questions on the scope of English literature in relation to the wider frame of literatures in English. It also invites us to reassess our own remit as scholars, prompting us to interrogate the very notion of literature as system and, by extension, even our very notions of the literary and literariness. 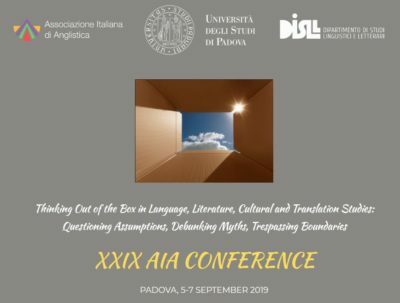 The 2017 AIA Conference (‘Worlds of Words: Complexity, Creativity, and Conventionality in English Language, Literature and Culture’) focused on the dichotomy of convention and creativity, and thus constitutes an excellent starting point for the discussion to which the 2019 Conference invites the scholarly community. We may start with the issue of canonization, the most obvious ‘box’ for literary studies. It is an immensely helpful and equally dangerous tool, which demands adherence to general rules, striving to fit each individual writer to a norm. Often, challenges to the canon, whether they come from feminist, Marxist, postmodern, or new historicist studies, have resulted in the creation of an alternative canon. In this conference we seek to interrogate canonicity itself: by looking at case studies, critical schools, influential anxieties and maverick figures, we intend to explore the tensions between creativity, old and new conventions, critical clichés. World Literature interrogates the possibility of a national canon, and asks us to look, instead, at book circulation, reception, translation, and adaptation. As we move away from the idea of national literature (based on the conventional equation ‘one nation: one language’) and towards transnational or world literature, literary genres acquire new centrality. The recent insistence on categories such as the global novel underlines this concept, but we may find this is also a good opportunity to re-explore the past century of book production and dissemination. Another consequence of the global re-thinking of the idea of literature is the development of translation studies, which have recently acquired more and more importance, as they chart book circulation and transformation, not only in contemporary literature, but also in the past centuries; excellent examples of the ongoing scholarly debate are the Brepols series ‘The Medieval Translator’, now celebrating thirty years of activity, and the more recent ‘MHRA Tudor and Stuart Translation Series’, which has so far published over fifteen volumes. Genre mobility: the relationship between synchronic theorization and diachronic complexity. Subverting identities, creating new identities, undoing the identity obsession. Genres and the individual text. New critical trends: questioning theoretical boundaries, mixing theories, challenging /undermining theoretical orthodoxies. Returning to history: from the neo historical novel to Neo-Victorianism and Neo-Edwardianism. New ways of narrating literary history, beyond national/temporal delimitations. Women’s writing: neither Milton’s daughters nor Frankenstein’s mothers. Out of the norm and into revolution, from the Peasant’s Revolt to BrexLit. Translation and untranslatability: how well does a text travel? Alternative worlds, from Utopia to science fiction to fantasy. Reading in the Digital Age: a new approach? New projections of writing: the visual/verbal paradigm and beyond Digital humanities: does this approach prompt us to think out of the (text) box? Engaging with difference in the literature classroom. We will take into considerations both proposals for individual papers and for panels (3-4 participants). Proposals for each individual paper should be approx. 400 words long. Please send also a 200-word bio for each participant. ‘thinking out of the box’ has indeed triggered numerous explorations within and across fields, disciplines, discourses, media. A few decades since their initial inception, and many accomplishments achieved, a possible danger for studies on culture, theory, embodiment might be that of considering them no longer necessary, as part of an outmoded agenda. We invite proposals that deal with theoretical, methodological, artistic, literary and widely cultural discourses and engage with the relevance and the always transformed/transformative commitment to multi-disciplinary and collaborative approaches which transgress and invade discursive, political and academic fields. Reading, writing, acting, across borders. Visions and revisions of the classics. Children’s and young adult fiction. Graphic novels, picture books, visual narratives autobiographical fiction, memoir, faction. Surveying and reconsidering the postcolonial / decolonial suggestions. Performative approaches to learning and creating culture. Ecology of culture(s), ecocriticism on the move. Old and new approaches to trauma in art, literature, new media. Escape the box of the workshop! We welcome proposals that move across the three domains of this conference – language, literature and culture – for a truly interdisciplinary approach to English studies. Please note that offices will be closed from 4 to 18 August 2019. Registration will not be possible during that period.